Motorino Pizzeria Napoletana Promo: Get 10% off on all Pizza flavors! Enjoy FREE delivery when you order from Tous les Jours! Computer and Office Deals Up to 40% off! [Android App Only] Samsung Grand Deals Up to 40% off! [App Only] Shopee Mart Deals Up to 60% off! [App Only] Groceries and Pet Care Sale Up to 80% off! Watsons on Metromart: Buy health and beauty essentials + Get Cashback! [App Only] Shopee Promo: Samsung Sale Up to 40% off! Stay Longer and Save Up to 20% off in NYC! Hotels in Bali starts from P621 + Get Cashback! Book Early on our Vietnam Trip and Save Up to 30% off! Beauty & Wellness Vouches Up to 90% off discount! Hotel & Airfare Coupons Sale Up to 50% off! Buffet Vouchers Up to 50% off discount! We have consulted our very own almanac and we foresee promising signs of massive savings and Chinese New Year deals all around! There is no reason for you to not participate in this campaign with ShopBack if you’re looking to shop more and spend less. There are no shortage of merchants offering you the best CNY deals and some of them include giants such as Lazada, Shopee and Zalora – everything you need to glam everything up for Chinese New Year this 2019. CNY is plenty enough reason for you to indulge in some retail therapy. It is a tradition that has been set in stone – all the clothes you are decked in for Chinese New Year should be brand spanking new! Well since they said so, then who are we to argue against tradition (as if we need any reasons to shop!) Browse through the online fashion megastores Zalora and ASOS for the fieriest clothing offers and deals in town. Use this opportunity to turn heads and show off your sense of still to be the belle of the proverbial Chinese New Year ball. Lazada offers you the widest range of tipples for you to usher. From the smoothest of Irish and Japanese whisky to the finest of cognacs and brandies, Lazada has it all for you in their widest range of drinks to tickle your fancy. Even if you are more of a wine connoisseur they have a range guaranteed to make any wine lover swoon with joy. So go ahead and bring everyone together and toast to good health and wealth this CNY with Lazada Philippines. Extend the festivities to your own home by jazzing it up with shiny new upholsteries and furniture. Chinese New Year means spring cleaning and sometimes it is good to let go of the old and welcome the new – and along the way welcome prosperity to your life. There are plenty of online merchants you can shop at to get the best deals on new furniture such as Lazada, AliExpress, eBay and AliExpress. Shop during these prosperous sale to not only get a new sofa but also a whole brand new living room – or kitchen or a bedroom while you’re at it. Watch this space to not miss a single breathe on the latest updates of the best Chinese New Year deals or offers. 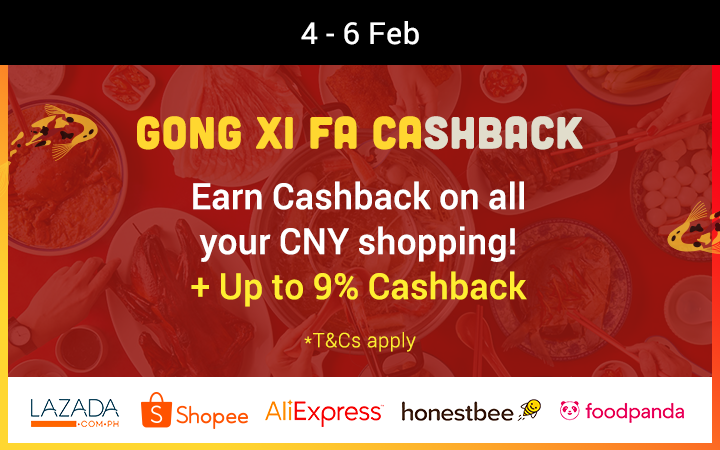 Bring about prosperity through savings with ShopBack!